These are just a few of the thoughts that have stayed with me after reading this book. If you’ve read the book, share some of your thoughts in the comments below. If you haven’t read the book, this is highly recommended. I remember being assigned to read The Third Wave by Alvin Toffler in my undergraduate business management class. I was intrigued about it so I ended up reading the prequel – Future Shock – and the third of the trilogy – Powershift. One-word titles seemed to be the trend back then as well. 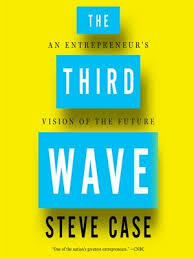 I bring this up because Steve Case says it was Toffler’s book that gave him the inspiration for the title of his book, The Third Wave. Toffler’s subtitle was “a classic study of tomorrow.” Case’s subtitle is “an entrepreneur’s vision of the future.” Both books attempt the same thing – to forecast what will the future look and be like so we can prepare and thrive in it. It is interesting to note that all these books of the future consist so much of what is currently happening around us. The secret is most of what is happening around us has been happening in secret or accessible to only those with special “clearances” – like Case, a member of the Presidential Ambassadors for Global Entrepreneurship and a founding chair of the Startup America partnership, a White House initiative. But the extension of where technology is today to where it will be is not to be discarded because Toffler and Case begin with what is closest to them – and hence to us. The key to a success as a futurist is to be able to guide the rest of us into an “acceptance” of a sort of what is to come. Where last year, robots ruling the world ruled the bookshelves, this year, Case brings back the argument that humans still and will continue to rule. But these books are also cautionary tales reminding us of the curse suffered by Cassandra – a Greek woman who could foresee the future but would not be believed. Should we believe Toffler, Case or any of the others who write such works? I have found that that answer depends on where you are in society, in your business, and in your career. Keeping in mind that Case’s focus is not just the business world in general, but the entrepreneurial one in specific, he is sometimes at odds with another author – Alec Ross – whose book “The Industries of the Future” was also published this year. Depending on who you want to believe – for future predictions are based on how much you trust the fortuneteller – technology will help or hinder, expand opportunities or increase the opportunities lost, make us all equal or create a digital caste system down to a genetic level. But for both a secure future occupation (at least in the near short-term of five to ten years) would be cyber security. Below are some quotes from Case’s book. It is a relaxed read for the most part and can be done in one sitting – maybe one and a half. Ross’s book is more detailed with facts, history, and stories, and more overwhelming in terms of the financial discussions regarding blockchain technology and the future of currency. Case touches on those issues briefly as his focus is what entreprenuers can apply now. Ross wants you to be able to understand today for context. Case wants you to understand today for content. The Three Waves of the Internet: First Wave (1985-1999) Building the Internet; Second Wave (2000-2015) App Economy and Mobile Revolution; Third Wave (2016 = ??) Internet of Everything.